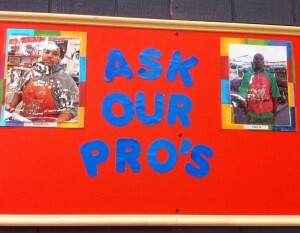 Why not just ask the pros? I’ve been trying to lay off my rants lately about signs that drive me nuts (see Signs), but after seeing a sign at the local Home Depot that’s been up there for months, I think I’m back on the beat. There’s a few offenders I’ve been eyeballing anyway. Now, of course, I will be the first to admit that this isn’t Grammar Depot, but is this necessary? To whom should I address my question? The Pro? Or something that The Pro possesses but which is apparently not named here? Why even use the apostrophe at all? The Pros is perfectly fine. Sure, it might look weird, but there’s a lot that looks weird that’s right.